6000 C-Tec2 Engine With Dsi: This 599cc 2-stroke DSI is the unmodified version of the engine that’s been launching Team Arctic down the racetrack since 2012. This quick-revving, 125-class horsepower C-TEC2™ power mill is the product of a world-class engine assembly plant - ours. Whether you’re riding a ZR® an M or a Crossover, the 6000 is one of the most satisfying engines found in a snowmobile. Arctic Race Front Suspension: Our uniquely wide A-arm spacing complements the chassis design, which allows us to maintain a tighter suspension. Arctic Cat® Gas IFP shocks feature a hard-anodized aluminum body, 0.5-in. shaft, aluminum internal floating piston and high-quality seals and ice scrapers. For added strength, the eyelet on the shaft end is forged, replacing the welded design. 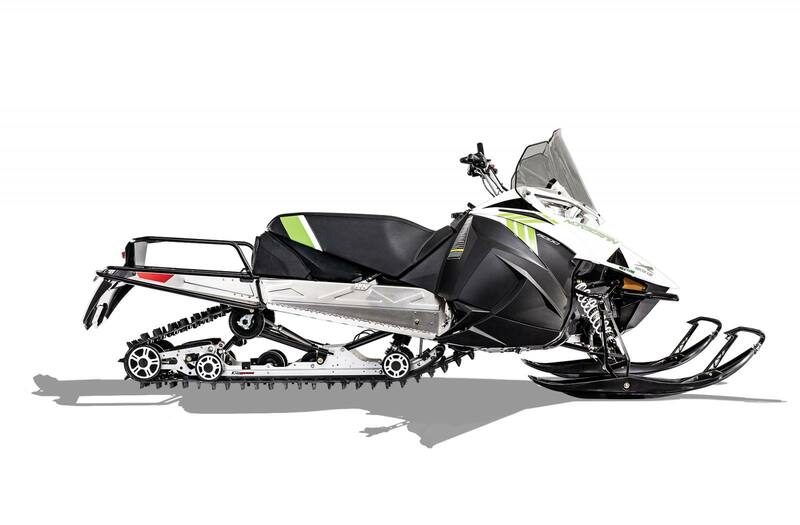 Xtra-Action Rear Suspension: This articulating system allows the rear of the suspension to move up and down as you ride across rougher snow, making your machine more maneuverable and more versatile. Backing up in the unlocked position allows the rear of the frame to lever up, rather than dig into the snow. For more traction, just lock the skid and you’ll have a straight-rail suspension that takes full advantage of the track. 146-In. Cobra Track With 1.6-In. Lugs: The 146" Cobra track’s cupped lug design delivers superior handling, acceleration and braking in loose snow conditions. Its traction teeth add extra grip on hard-packed surfaces. The 1.6" paddles provide extra traction when you venture off trail. Proute - 10/8 Skis: 10" at their widest, tapering to 8". The tipped-up design allows you to run on deep snow without trenching. Whether you’re working or touring, these skis provide effortless stability on and off the trail. 17" High-Height Windshield: The extra-high windshield tames the wind out in the great white open. 15 in. (38.1 cm) x 154 in.